The LivWild saw has highly visible straps and a cutting tooth on every link. It’s my father’s fault. For years, during my summer vacations from grade school he’d load our station wagon, a 1956 Ford Ranch Wagon, with a 42″ one-man crosscut saw, a splitting maul, and a half-dozen wedges, and we’d head for the beach. Back then, rafts of logs were towed by tugs up and down Washington State’s Puget Sound, and a lot of logs got loose. The beaches were thick with driftwood that never made it to the sawmill. Dad and I went after the red cedar, sawing it to length and splitting it for fence rails and slats. After a few summers, the whole lot around our home was surrounded by red cedar, over 150 yards of it. So, I picked up an unshakable habit of combing beaches for useful driftwood. I gather red cedar, yellow cedar, Port Orford cedar, Douglas-fir, and spruce, and use it in my boatbuilding and making everything from musical instruments to Shaker boxes. I have my father’s crosscut saw, but it’s not practical to carry aboard a small boat. That’s when I take a pocket chainsaw. It’s compact enough to carry even when I’m out kayaking—if I find something good, I’ll tow it. I once sawed an 8′ length of yellow cedar from an especially fine-grained log, and towed it 1-1/2 miles by kayak back to the launch site. Back in the ’60s, I used twisted-wire pocket saws for backpacking and they were fine when I only needed wood for campfires and to do some whittling. They didn’t last long before they broke. 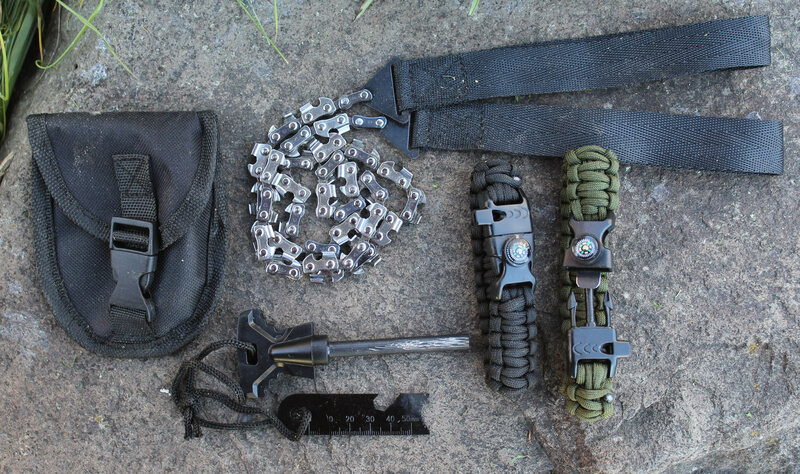 I now use chain-style saws, and the latest version, the Camping Pocket Chainsaw from LivWild, works great. 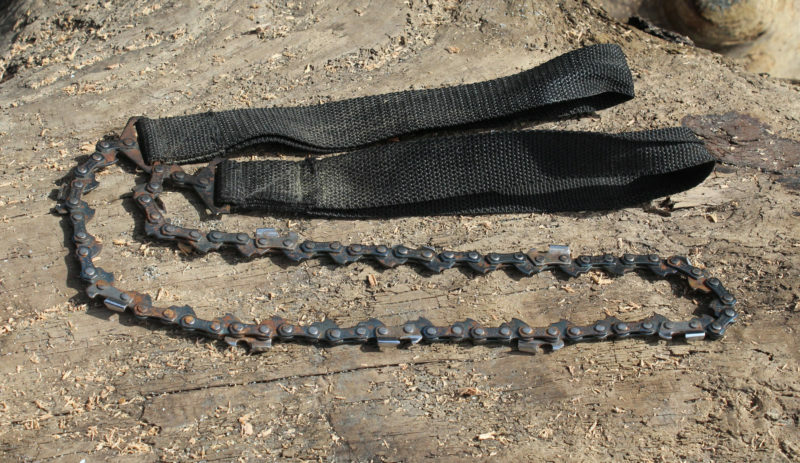 It has a 28″ chain with 37 teeth, the same kind used on motor-driven chainsaws. Every link is a cutting tooth, with adjacent teeth facing in opposite directions. The handles are bright orange 1″ webbing, lessening the likelihood that I’d inadvertently leave it behind. Some versions of the pocket chainsaws, like the Saber-Cut, have teeth facing in both directions, but, like a power chainsaw chain, have gaps between teeth. I put the LivWild saw up against the two other pocket chainsaws I’ve been using. 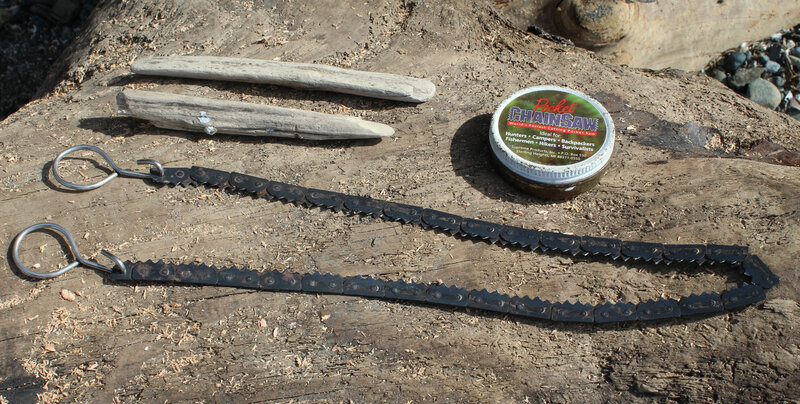 The Saber-Cut Chainsaw from Ultimate Survival Technologies has a 25″ chain with 11 cutting teeth, one every third link. The backs of the intermediate links have the fin-like extensions meant to engage the drive-sprocket teeth of a power chainsaw. They serve no purpose in a pocket chainsaw. The Pocket ChainSaw has wire loops that use bits of driftwood for handholds. The other saw, the Pocket ChainSaw from Supreme Products, is 28″ long and has its own style of links and teeth. Each of the 62 links has two symmetrical teeth, bent to the outside to provide clearance in the kerf. The teeth are stamped but not filed, so they have chisel edges like a ripsaw’s. I took a triangular file to the teeth to give them a sharp-points like the teeth of a crosscut saw. Pocket ChainSaw cuts a kerf that’s 1/8″ wide, half that of the other saws. To make the saw fit into its can, the loops that attach to the end of the chain are removable and require small foraged sticks for handgrips. In recent beach trials, the LivWild saw got through a 2-1/2″ driftwood limb in 17 seconds and the Pocket ChainSaw took 14 seconds. The Saber-Cut did fine for 8 seconds, but then started to grab. I gave up on it after 37 seconds. That last bit of the limb had a tight radius, about ½”, and the widely spaced teeth got hung up on the sharp turn. The Saber-Cut has fared better on larger logs where the last bit of wood to cut through is small enough to be broken, but doesn’t cut as smoothly as the LivWild. Having ruled out the Saber-Cut for general use, I compared the LivWild and Pocket ChainSaw on the end of a log about 7″ thick. The LivWild got through in 50 seconds, including a break to get myself positioned more comfortably. It took me 127 seconds to get the job done with the Pocket ChainSaw, including a half dozen breaks to catch my breath. It seemed that the saw couldn’t clear the sawdust quickly and it clogged the kerf, adding a lot of resistance. Beavers chewed this red cedar down, but the LivWild saw couldn’t take much of a bite out the wet wood. On a recent rowing outing I found a red cedar that had been felled by beavers. The trunk was about 10” in diameter and the wood was still green and wet. 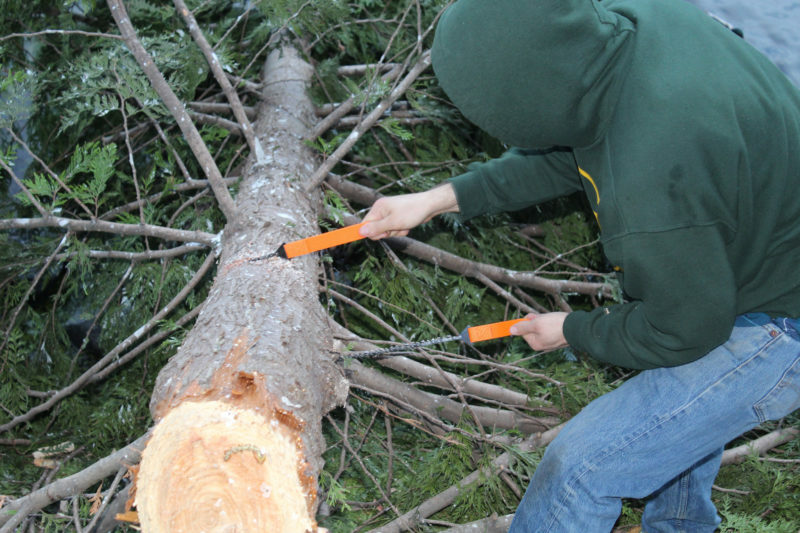 The LivWild easily cut branches about 3″ thick, but on the trunk it only got through the bark and about 1/4″ of sapwood. After the chain was buried in the kerf, the teeth began to grab and it wasn’t worth the effort to continue. I don’t often find freshly fallen trees, so I wasn’t overly disappointed by the LivWild’s limitation. It works well on driftwood large and small and will be my steady beachcombing companion. The LivWild pocket chainsaw, with nylon pouch, survival booklet, and mylar blanket, sold through Amazon for $22 was not available at the time of publication. There are a number of nearly identical saws with teeth on every link: a 24″ 33-tooth with pouch and survival bracelet, a 24″ 33-tooth with pouch, and Jusstech’s 24″ 33-tooth with pouch, fire starter and two paracord bracelets. The Pocket ChainSaw with storage can and handgrips is available for $24. I ordered the Justech kit to confirm that the saw would be a good substitute for the LivWild saw. 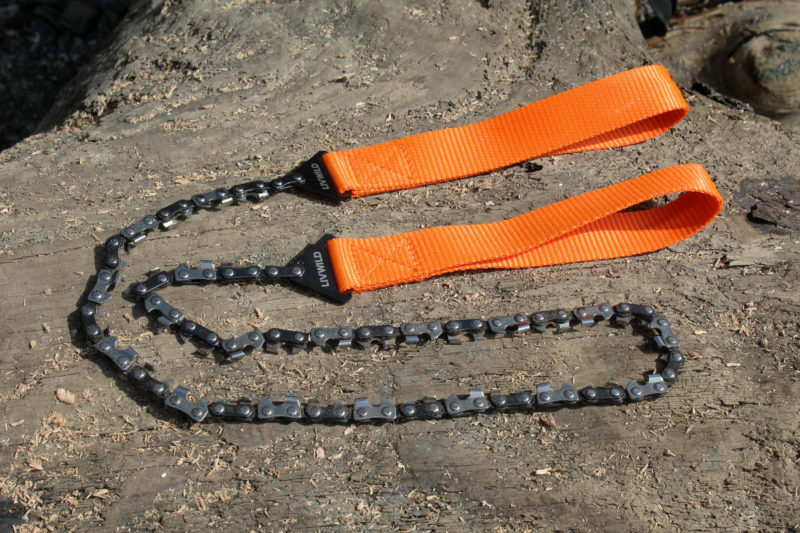 The chain is 4” shorter—not an issue for any logs up to 8” in diameter—and cuts just as well. The saw comes with a pouch, a 2-3/4” ferro rod with steel scraper, and two 9” paracord survival bracelets, each with a whistle, compass, and fire starter built into the buckle. Both the large and small fire starters ignited dry paper tinder with a few scrapes of the rod. At $17 for the kit it’s a good value. Is there a product that might be useful for boatbuilding, cruising, or shore-side camping that you’d like us to review? Please email your suggestions. Good article. Very helpful. I assume a can of 3-in-1 oil is a necessary accessory to keep the saw from rusting into a useless lump? Oiling the chains would certainly help maintain them. I don’t recall ever oiling the Pocket ChainSaw or the Saber Cut. In the photos of those two saws you can see some discoloration caused by rust, which I could have prevented by using a bit of oil. Both of those saws still work and none of the links have seized up. I don’t recall exactly when I acquired these two saws, but I believe I’ve had the Saber Cut for close to 10 years and the Pocket ChainSaw for about 20. The chains may have held up as well as the have because I primarily use the saws on dry driftwood and usually carry in my pocket where they quickly warm and dry.